I love how a recipe evolves over time. Many risottos have been made in my kitchen over the years and I have to say a pea risotto has got to be one of my favourites. 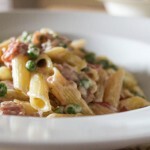 This recipe for pea, bacon and sundried tomato risotto is, in my opinion, the very best it can be. Other variations have included chorizo, fried speck, mint, goat’s cheese or spinach but this combination of ingredients gives such a variety and depth of flavour that is hard to beat. Start by adding the oil and onion to a saucepan and frying gently for at least 15 minutes until the onion is softened and not coloured. Add the garlic and sundried tomatoes and continue frying for a few more minutes. Stir the rice into the onion mixture and cook for another minute or two before adding a little vegetable stock. Add a little vegetable stock to the rice mixture at a time stirring well between each addition and ensuring the stock has been full absorbed before adding the next. While the risotto is cooking you’ll need to get a small pan of water boiling for the peas and a frying pan heating up for the bacon. Test the rice to see if it’s cooked and if so, remove the pan from the heat, pop the lid on and leave to one side for five minutes. While the risotto is resting cook the peas in the boiling water and fry the bacon until crispy. Blend the peas with a little butter to make a rough puree. If you’d rather add the peas whole that’s no problem, I just love the bright green colour blending them gives the risotto. Stir the peas, bacon and Parmesan into the risotto, check the seasoning and add a little salt and pepper if it needs it. At the heart of any good risotto is of course the perfectly cooked rice, cheese and onion combo. Adding the sundried tomatoes gives such a punchy, savoury flavour which coupled with the sweet peas and salty bacon is just the best. 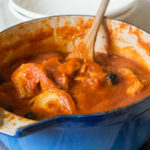 Slightly different to my normal weeknight recipes where I try to use as few pans as possible this recipe is definitely worth the extra washing up. Such a comforting and delicious meal! Oooh, I love the sound of this risotto – it’s kind of a spin on carbonara with the bacon and Parmesan. The addition of peas thought sounds heavenly! 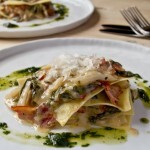 This sounds wonderful – like a spin on classic carbonara with the bacon and Parmeggiano. The addition of peas is brilliant! You can never get it wrong with a nice risotto. Beautiful! Gosh, this looks wonderful! So many great flavors, and such a satisfying dish. Thanks! I would never have thought of making pea risotto! Looks great and everything it better with bacon! this hits all the right notes for me! peas are one of my favorite vegetables and i just don’t think they’re used enough. love those tomatoes too!! Sounds and looks soooo comforting!